Kelly Barnhill - Iron hearted Violet. Absolutely everything from this book sounds amazing and the cover is gorgeous. Bianca Ison - Anne Boleyn and the Zombie Apocalyps. Expected publication: December 25th 2013. It all started with a simple bite. Anne Boleyn woke on the eve of her 16th birthday expecting a small gathering with her father Thomas and her sister Mary and archery hunting in the woods behind their home. What she got was a country ravaged by fire and death. Her mother eaten in half on the kitchen floor. Her sister and father infected and hunting her down with the rest of the walkers. And a group of teens hellbent on survival - the Swordsman Marquess of Pembroke, Prince Henry VIII of England, Axe wielder Jane Seymour, and Dagger wielder Catherine of Aragon. In a world now in turmoil and ruin, Anne must learn to survive the Zombie Apocalypse... or become one of them herself. Anne Boleyn AND zombies? Enough said. Ooh that looks intriguing! Haven't heard of this series! I can't tell if the first story is middle grade or not based on the cover but I like the synopsis - dragons are always good. Wow, haven't heard of either of these but they both so crazy interesting. Anne Boleyn and zombies? The possibilities of imagination are clearly endless! Oooh, hadn't heard of the first one but I do love fairy tales. And I am NOT at all a fan of zombies but somehow the combination of zombies and all the wives of Henry VIII armed with daggers and swords just makes me laugh. (Though I'm not sure how all those characters could be teenagers since IRL Henry and Catherine were maybe 20 years older than Anne and Jane) Still, I might have to try that one! Come check out my WoW pick! The book seems very interesting, by the way. Ooh, Anne Boleyn & the Zombie Apocalypse sounds awesome--thanks for putting it on my radar! I have this one and it looks so amazing. I can't wait to read it. Looks really good and exciting :) I love adventures and fantasy books, and this one sounds like a very interesting one :) Thanks for bringing it to my attention! Anne Boelyn and zombies? I'm in! And I'd buy "Iron Hearted Violet" for the cover alone. Great picks! Thanks for stopping by. Both of your picks sound awesome! I am definitely going to add both to my TBR!! Thanks for stopping by my WoW and sharing. Thanks for stopping by my my WoW! Iron Hearted Violet sounds great, and I absolutely LOVE that cover!!! Wow. Sounds like it belongs on my tbr pile! Thanks for pointing it out for me and for stopping by my blog! Oh, I love it that "Iron Hearted Violet" is not a common fairy tale. It sounds really good. And it's got a book and a dragon and a princess - what can go wrong? ;) Also, the cover is great. Thanks for sharing and dropping by our blog! So I totally considered this for my WoW pick this week, but I didn't read the summary. Anne Boleyn AND ZOMBIES! Now I REALLY NEED IT. Wow, Anne Boleyn and Zombies? Interesting combination! Iron Hearted Violet sounds like it would be a good read, too. Great picks and thanks for visiting! Iron Hearted Violet sounds fascinating. I think I'll add that to my list of books to read. Haven't heard of either of these but Iron Hearted Violet sounds fabulous. Great choices. Ohh Iron Hearted Violet sounds awesome!! Thanks for sharing!! Ooo, both sound great and I haven't heard of either one! I really love the sound of Iron Hearted Violet I'll definitelt be checking that one out, great picks, thanks for stopping by! I haven't heard of either of these but they sound fairly interesting. I love your picks for Wow! The first one sounds amazing and the cover is PERFECT. The second one, omg, zombies and Anne Boleyn!! That's definitely going on my to-read list as well. Awesome picks! They both sounds really good. I definitely have to read the first one right away. Oohh I like how you featured middle grade books. It sounds so awesome! BOTH sound amazing! Thank you for dropping by! I love the sound of Iron Hearted Violet. - a dragon and a different fairy retelling :D It looks awesome!!! Great choice! I've never heard of it before but it sounds really good! Thanks for stopping by my blog! The first book sound like I would def like it..I mean un-princess like princesses and dragons? oh yeah. And as a lover of zombie books the second one sounds wicked awesome! Iron Hearted Violet looks amazing. I think that is something my daughter and I will both love. Thank you for bringing it to my attention! I love the synopsis for Anne Boleyn and the Zombie Apocalyps. Great pick! MIND BLOWN. Anne Boleyn and ZOMBIES?!!? I MUST KNOW WHAT IS GOING ON! Sorry for the caps, I couldn't express my enthusiasm any other way. Thanks for sharing these awesome picks and stopping by mine! 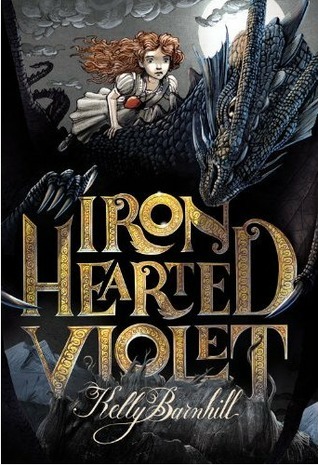 Love the cover of Iron Hearted Violet and they both sound awesome! Great picks! Oh wow, that Anne Boleyn one looks awesome! wait.....The Tudors...and zombies? WHERE HAS THIS BEEN ALL MY LIFE, MY TWO LIFE PASSIONS! O.O Thank you for opening my eyes. I've seen this one before, I have it on my goodreads. =] Thanks for sharing and visiting my WoW. Oh yes! I really want to read Iron-Hearted Violet! It sounds exactly like the type of MG that I love to read. And I can't help but be reminded of Merida from Brave. Oh wow! Anne Boleyn sounds freaking awesome. Thanks for sharing! I haven't heard of either of these two books, but they book sound amazing! Love the reckless princess with the dragon, and I love zombies as well! I'm adding both to my Wishlist. Anne Boleyn and zombies indeed! I can't wait to see the cover on that one! These both sound really great! Awesome choices!! That first one sounds great! And the cover is awesome! Hope you enjoy them both! The second one sounds crazy! I wonder what the cover will look like. I've only read one Zombie book before, but I might have to try this one. Thanks for stopping by today. A seriously good combo in this book - can't wait to read it! Great picks! I haven't heard of either of these ones yet but they sound really good. Definitely adding them to my list. I love zombies! I haven't heard of this one but from what you said it sounds very interesting! I might have to take a look! This does look really good. Thanks for stopping by my blog. Oohh these both look interesting. :) I actually haven't heard of either of them. Thanks so much for dropping by and commenting on my WOW! Much appreciated!! Anne Boleyn and the Zombie Apocalyps sounds different! I love zombies. Iron Hearted Violet sounds like a cute fairytale. Great picks! Thanks for stopping by! Iron Hearted Violet does have a pretty cool cover and story. It reminds me of The Never Ending Story--with a contemporary twist! I've never heard of it. Thanks, off to add it on my TBR list! I am so in love with the cover of Iron-Hearted Violet!! It sounds like such a fun fantasy, too. Can't wait. This is the first time I came across these books.. I didn't know about either of these! They sound awesome, especially Iron Hearted Violet. Thanks for sharing! I love twisted fairy tales! Great pick. Thanks for stopping by! Iron Hearted Violet looks fabulous!! I love that cover...and a book about dragons? Yes please! i love that cover of iron hearted violet!! i want it blown up so i can hang it on my wall. thanks for stopping by our WoW. Thanks for stopping by. It sounds good and cover is amazing. I hadn't heard of this book before, but Anne Boleyn and zombies sounds like an interesting combination. Thanks for stopping by my WOW. I am SO EXCITED about this!!! I hope we get to read it soon!!! Thanks for stopping by my wow. I hadn't heard about this one but I hope you enjoy it when it comes out. Great pick! Thanks for visiting my WoW post! Sounds amazing and I haven't seen it before. Great pick! Haven't heard both of these but the second what sounds AMAZING! I'm definitely adding that to my TBR! Thanks so much for sharing and for stopping by my WoW post too ;D I'll waiting on this along with you from now! Love the premise! Amazing picks. The Anne Boleyn one sounds awesome! I most definitely adding this to my TBR list. Thanks for sharing and sorry for the late reply!